This week, we take a look at a couple of final releases from Del Rey Manga, as well as new volumes from Viz Media and Vertical, Inc.
MELINDA: I was going to open tonight’s discussion with a text rendition of “Over the River and Through the Woods,” but I realized probably neither of us are headed to grandmother’s house tomorrow. MICHELLE: Well, I might end up at a grandmother’s house, and though this will include going over a river, there aren’t any woods. More like a security gate. MELINDA: I suppose if you consider that my mother *is* a grandmother, that counts for something. And I’ll have to drive through some woods, so perhaps between the two of us, we have it covered? MELINDA: So how have you been passing the time leading up to your turkey coma? MICHELLE: Well, as you no doubt are aware, Kodansha recently announced that they’ll be taking over distribution of Del Rey’s titles. The last batch of manga to come out under the Del Rey label was released yesterday, so I was marking the hopefully-not-really-a passing of a great publisher by checking out some of their newer releases. 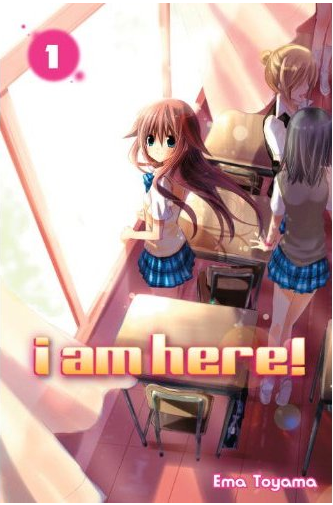 First on my agenda was the first volume of I Am Here!, a five-volume shoujo series—originally published in the magazine Nakayoshi—that is being released here in two omnibus editions. It features Hikage Sumino, an 8th grader so severely shy that she’s practically invisible to her classmates and the world at large. Her existence is a lonely one, for although no one’s picking on her, no one knows her name, either. The only friends she has are Black Rabbit and Mega Pig (I am not making this up), frequent readers of her blog who provide her with advice and encouragement. One day Hikage falls victim to the “locked in the gym storage room” cliché and is found by Hinata, one of the most popular boys in school. Any time Hikage played hide and seek as a child, “it” never remembered to look for her, so to be found at all is quite a big deal for her. She begins hanging around Hinata more, who pretty quickly confesses that he likes her. Even the small amount of socializing they do raises the ire of Hinata’s possessive fangirls (another cliché) and Hikage is subjected to bullying and a notoriety that she never would’ve expected. Eventually, she grows enough spine to refuse to agree to stop hanging around Hinata and vows to become the kind of person who can handle being his girlfriend. So, yes, there are a lot of clichés in this story. But somehow its quiet earnestness really worked for me! Maybe it’s because I’ve been reading a good deal of shounen and seinen manga lately, but something as sweet and simple as I Am Here! proved genuinely entertaining. All of the characters are fairly lackluster, but I still enjoyed reading about them. Of particular note is the fact that Hikage keeps a blog and counts two members of the online community among her close friends, which kind of weirds out Hinata. In any other shoujo series this full of tried-and-true story elements, I would be absolutely convinced that Hinata is Black Rabbit, but I’m actually not sure. Probably he is, but all the same I’m impressed that I still have a tiny shred of doubt about that halfway through the series! All in all, this was a pleasant surprise and I hope that Kodansha sees fit to release the second half in the not-too-distant future. MELINDA: Okay, first of all, I feel quite sad that I’ve never looked at this series, because it actually sounds quite appealing to me. And secondly, if Hinata *is* Black Rabbit, who is Mega Pig?? I MUST KNOW. I. Uh. Really like pigs. MICHELLE: Do you? I never knew. The likeliest candidate for Mega Pig is Teru, Hinata’s blunt-but-kind slackery pal. But I have to wonder if it isn’t him who’s actually Black Rabbit. Oh, the mystery! And you needn’t feel guilt for not having read this because it literally came out yesterday. MELINDA: I am on pins and needles and I haven’t even read the thing! MICHELLE: Well, good. I hope it sells well and earns a second volume. What’ve you been reading this week? MELINDA: I’ve been catching up with new volumes of a couple of favorite series! 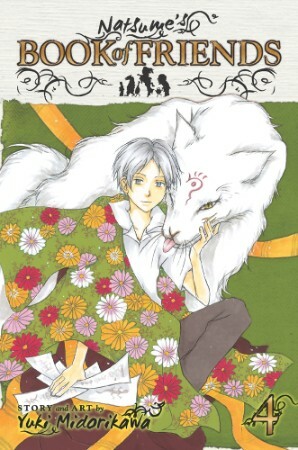 First off, I have the fourth volume of Natsume’s Book of Friends. I’ve discussed this series here before, and I specifically wanted to revisit it here because though last time I mentioned my fear that it was beginning to lose momentum, volume four has completely turned me around. The volume begins on a strong note, by introducing a troubled yokai who ends up inhabiting the body of a snow bunny (not the kind found on ski slopes, but in children’s back yards) in order to try to reunite with his one-time yokai companion who had been driven to the dark side by the cruelty of humanity. While that concept sounds at once unbearably cutesy and melodramatic, its execution is anything but. It’s subtle and moving, and in that moment, the series won me back completely. Incredibly, things only go up from there, as the next few chapters begin to really develop Natsume’s relationships with both his “cat” bodyguard, Nyanko-sensei, and sketchy actor/exorcist Natori, the only other human Natsume knows who can see yokai, and with whom he feels a reluctant bond. Even the volume’s final chapters, three short side-stories told from a yokai point-of-view, add to the strength of the volume. Another of this volume’s real pleasures is in Yuki Midorikawa’s artwork, which just gets more and more lovely as the series continues. The refinement of the manga’s emotional content is enhanced beautifully by Midorikawa’s expressive faces and haunting panel choices. Also, the snow bunny is so adorable, he gives even Chi a run for her money. It’s a winning combination. I’m so glad I decided to stick with this series. MICHELLE: I haven’t read any volumes of this series since the first, but have always planned to continue. I definitely liked its episodic charm, but I think the key to motivating me may just be the snow bunny! MELINDA: Is this something anyone could resist? IS IT? MICHELLE: Aw. He’s a sad adorable bunny! MELINDA: Sometimes he’s an angry, determined, or sweet bunny too, and he’s adorable every time! I think the cutest time may actually be when Natsume’s aunt discovers the snow bunny and makes him a friend. :D There’s really no end to the adorableness. Yet, it never derails the seriousness of that story. It’s skillfully done. MICHELLE: Snow bunnies. Evidently the way to my heart. MELINDA: I believe they are the way to everyone’s heart. MICHELLE: Continuing the Del Rey theme—and, indeed, I plan to continue for the next two columns!—I read the two-volume shoujo series Panic X Panic. Back in 2001, when I first learned about shoujo anime, I heard about a series called Daa! Daa! Daa!, which I think revolves around some kids raising an adorable alien baby. I never actually saw any of it, but I always harbored a wish that the manga (along with other cute older series like Hime-chan no Ribon) would get licensed. 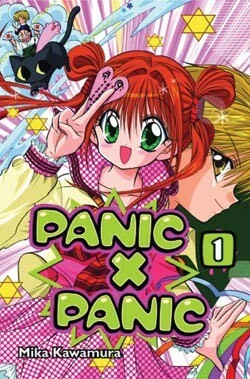 What I didn’t realize until I finished the first volume of Panic X Panic is that it’s by the same creator! Unfortunately, it’s really not remarkable in any way. Mitsuki and Kakeru grew up across the street from one another, the heirs to a family-run shrine and church, respectively. Like their fathers, they bicker constantly. When simultaneous coming-of-age ceremonies bestow on them the power to banish demons—at precisely the moment that a 2,000-year-old seal fails, allowing demons back into the world—they vow to take up their duties without the other’s assistance. The demons are utterly unimpressive, with “attacks” consisting of things like feeding Mitsuki a catnip cookie so she’ll hang all over Kakeru and purr or sending the pair back into the past so they can see they were friends at one point in time and Mitsuki can realize that what caused her to dislike Kakeru for so long was actually not his fault at all. Blushing and love inevitably ensue. It’s not horrible, but two volumes is about all the story that it can sustain. I have a feeling it was canceled prematurely, since in the first volume there was talk of a quest to collect a bunch of holy beads in order to recreate the seal but the series ends before this goal is anywhere near being achieved. It’s probably for the best, since at two volumes it’s a bit of fairly diverting fluff. Any longer and one would get into serious, “Why am I reading this?” territory. MELINDA: Hmm… that sounds pretty tedious. Though now I’m also intrigued by the concept of Daa! Daa! Daa! MICHELLE: Yeah, it seems like it was pretty popular in its day. What else have you got for us? MELINDA: My second great read this week is the second volume of Nobuaki Tadano’s 7 Billion Needles. I’ve been eagerly anticipating this release (the series’ first volume was a recent Pick of the Week) and I’m happy to say that it lived up to my expectations and then some. In this volume, self-isolated teen Hikaru takes a trip to her former home island to visit her father’s grave, but between the alien entity, Horizon, who now lives inside her body and two new friends who insist on tagging along, she’s reluctantly far from alone. Upon her arrival, it’s quickly apparent that not all was right when she left. The only person in town who is happy to see her is an old childhood friend, and even he is carrying the weight of the past on his shoulders. Enemy alien Maelstrom turns up to cause trouble, which ultimately leads to our discovery of just why Hikaru retreated from others the way she did, and how vital it is that she’s finally begun to let them into her life. Though the story’s horror/sci-fi elements are what keeps its plot going, the real heart of this story is Hikaru’s journey toward becoming a real, living participant in her world, and this is a story Tadano tells very well. A sequence in which Hikaru is forced to face her worst nightmares in order to restore the island Maelstrom has destroyed is more genuinely haunting than I would have expected. Scenes that should feel cliche are simply chilling instead. When, within Hikaru’s nightmare, for instance, Maelstrom hands her the infamous set of headphones to help her avoid her pain, it should feel obvious and cheesy. But I actually teared up at this point. It was surprisingly effective. This series is really this year’s unexpected gem. I didn’t quite see it coming, but I’m so glad it did. MICHELLE: I am actually planning to review the first two volumes in the near future. I love the cover design on these, too—seriously, Vertical has some fabulous cover designers—with the retro look and slim feel. It really makes them stand out. MELINDA: It really suits the series, too, and nicely suggests its 1950s-era source material, Hal Clement’s Needle (which I very much want to read now). To some extent, the series’ artwork is one of its weaker points, at least in terms of character design, but the covers really show it off to its best advantage, accenting its sci-fi tone and tension. After all, character design is hardly what this series is about. MICHELLE: Maybe for one of our Let’s Get Visual columns we should focus on cover design! MELINDA: Is it time yet for pie? MICHELLE: It’s time for bed, prior to driving in order to partake in pie. MELINDA: Goodnight, then, and enjoy that pie! Happy Thanksgiving from Melinda & Michelle! And join us next week for an all new Off the Shelf! Oh yes, Natsume! You need to warn to bring tissues, though, if the reader is a person who feels with the characters. I basically cry at least once in any of the volumes and sometimes more.